Velociraptor! Cannibalism! 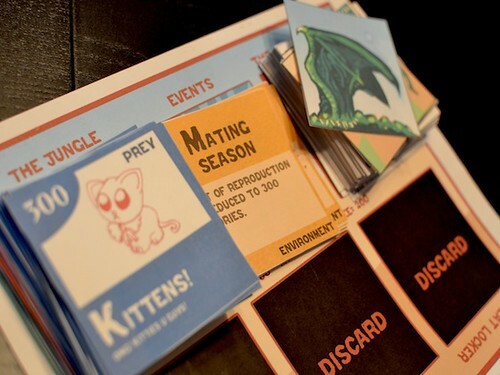 is a card game of survival, mutation, and stealing body parts. 1,016 backers pledged $43,619 to help bring this project to life. What is Velociprator! Cannibalism! ? Velociraptor! Cannibalism! is a card game of survival, mutation, and the occasional volcano. Based on a crude understanding of natural selection, Velocipator! Cannibalism! puts you in the role of a young, eager and bright eyed Raptor as they must eat delicious, adorable prey, survive environmental disaster, mutate and steal the body parts of other Raptors. How We Will Use The Funds? We are offering some great rewards for our supporters including a PDF of the game, original art, and an exclusive first run print edition of the game. SPRINKLES: For a dollar or more, all supporters will get access to the full text rules of the game. If you are interested in seeing how our game works, but aren’t sure you want to contribute a substantial sum before making a commitment, pledge at this level to see the details of our mechanics. BRIAN For $5 or more, supporters will receive a the PDF of the demo game that was created at the Global Game Jam, including the full rules manual, the completed character sheets, game mat, and the text-only cards. Although this will not have the full art we plan on creating, this level will include everything you need to print and play a game. COLDCUTS: For $18 or more, supporters will receive everything from the levels below as well as a PDF of the full game when the artwork is completed in all of it's artistic glory. This includes body parts fully illustrated, full art predator and prey cards, and box-art cover page. ACE: For only $22 or more, supporters will receive everything from the levels below, but the full version they receive will include a Kickstarter Only set of extra body parts (rumor says it'll be unicorn parts). IGGY: For a pledge of $75 or more you will get to design a body part that will be in the final game. Species, color, it can be anything! This reward includes a copy of the physical game if we raise $4500. Limit 5! YOUR NAME HERE: For being the first to pledge over $250, you get to design a new raptor, and we'll name it after you. Not only that, but we'll specially print you off a physical copy, even if we don't raise enough to open up that reward level to everyone. REGINALD: For being a foundation and being the first to pledge $500 or more, you get to design a completely custom character mat, drawn from scratch, just for you. Phoenix? Dragon? Robot alien from outer space? Whatever! (As long as its not copyright to someone else.) Not only that, but we'll specially print you off a physical copy, even if we don't raise enough to open up that reward level to everyone. Where Can I Learn More About the Art? We are six game designers that met at the Global Game Jam, and are dedicated to putting out the best possible card game about Velociraptor eating kittens. Join us as we produce a brand new card game where you can eat baby seals and wear a bow tie while you cannibalize your friends. Visit our website to view our bios and to read more about how we met. Going over our goal means that we get to offer more rewards to our supporters. We are excited about the possibility of producing these rewards. We've reached $4500 and unlocked two new reward levels! THE FULL CAST: At the $48 level, we are providing limited editions of the full physical game with the completed artwork. This includes the 6 player mats, the Kickstarter exclusive character, the main mat, game pieces, and 115 cards. This level includes shipping WITHIN THE USA. THE CAST ABROAD: At the $58 level, we are providing limited editions of the full physical game with the completed artwork. This includes the 6 player mats, the Kickstarter exclusive character, the main mat, game pieces, and 115 cards. This level includes INTERNATIONAL SHIPPING. Canadian sponsors, please take this level. We've reached $10,000, which means we will release an expansion to the game! This expansion will include four new player mats, 10 new prey cards, 10 new predator cards and 10 new body parts! This expansion will be made available as electronic copies to everyone who donated at the $20 or above, and physical copies will be made available to everyone who ordered a physical game. If we reach $50,000, we'll unlock a brand new expansion! If we reach $50,000, we will create a new expansion to the game. This new expansion will include new cards and artwork from our brilliant artist, Jennifer Rodgers. At $??? we'll unlock ???! Who knows! We've got all kinds of ideas for stuff we could give you: t-shirts, mouse pads, buttons, magnets, limited edition custom engraved espresso machines... The problem is: stuff costs money! We'd love to offer this stuff up front, but we're trying to raise money, not spend it! We've got a goal to meet (so we can pay people for all their hard work, past and future) and it's just too big of a risk out of the starting gate. But if you show us that you want our game, we'll unlock new reward levels as the total rises, because then we don't have to worry about losing money sending people their rewards and can instead focus on bringing you a bigger better game, and perhaps even more games in the future! Want to make sure you get your (shirt, mouse pad, magnet, engraved espresso machine)? Why, just pledge even more! When those rewards come out, if your pledge amount is high enough to include the new item, you'll get it automatically! Within reason, of course. We'll let you know in a future update! Help us help you help us bring Velociraptor! Cannibalism! to the table. SPRINKLES: Access to Kickstarter only updates, including the text rules of the game with the full game mechanics; not enough to play a game, but enough to wet your appetite. BRIAN: The ready-to-print PDF of the demo game. Includes the full rules manual, the completed character sheets and game mat, as well as text-only cards. Everything you need to print and play a game. COLDCUTS: Supporters at this level and above will get the final art print and play version of the game. Supporters will receive the demo version as well as the final version with full art as a ready-to-print PDF, but this time with more color! Body parts fully illustrated, full art predator and prey cards, and box-art cover page. ACE: Same as the COLDCUTS reward but with a Kickstarter exclusive set of bonus body parts. There have been rumors that it might be a unicorn. Or a potted plant. Or even a mad scientist's potted unicorn plant! THE FULL CAST: A limited edition of the full physical game with the completed artwork. This includes the 7 player mats, the main mat, game pieces, and 115 cards. This level includes shipping WITHIN THE USA. THE CAST ABROAD: A limited edition of the full physical game with the completed artwork. This includes the 6 player mats, the Kickstarter exclusive character, the main mat, game pieces, and 115 cards. This level includes INTERNATIONAL SHIPPING. IGGY: Design a body part that will be in the final game! Species, color, it can be anything! (We get final say on stats though, no +100 to everything cards!) This reward includes a copy of the physical game if we raise $4500. TWINS! : Two limited editions of the full physical game with the completed artwork. These each include all basic components, as well as kickstarter rewards and stretch goals included with the single game. This level includes shipping WITHIN THE USA. Please add $20 for international shipping. TRIPLETS! : Three limited editions of the full physical game with the completed artwork. These each include all basic components, as well as kickstarter rewards and stretch goals included with the single game. This level includes shipping WITHIN THE USA. Please add $30 for international shipping. LITTER!! : Five limited editions of the full physical game with the completed artwork. These each include all basic components, as well as kickstarter rewards and stretch goals included with the single game. This level includes shipping WITHIN THE USA. Please add $50 for international shipping. 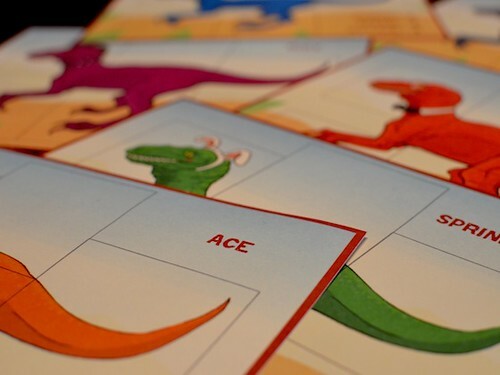 YOUR NAME HERE: Design a new raptor, name it, choose a color, give it accessories and a personality. Support at this level and you will get a physical copy of your own special raptor, that no one else gets! This reward includes a copy of the physical game. REGINALD: A completely custom one of a kind character mat with a totally new creature, drawn from scratch. This reward includes a physical copy of the game.